Hole In One Lands Man $500 Gift Card! Congratulations to Hardy Sauter on his first ever hole in one! Eagle, ID – What does making a hole in one feel like? Just ask Hardy Sauter, head coach of the Idaho Steelheads! Sauter aced the 142-yard par 3 hole 14 during the annual Ada County Sheriff Association’s Celebrity Golf Scramble at Eagle Hills Golf Course on June 5th. The acemaker used his 9 iron to get the job done and was awarded a $500 VISA gift card, compliments of Hole In One International! While no one managed to win the $25,000 vehicle on hole 5 that day, thanks to Hole In One International’s fabulous auxiliary prizes Sauter and every other player in the tournament still had several chance to win big on the remaining par 3 holes on the course – one of the many benefits of insuring with Hole In One International! Want to give everyone in your tournament multiple chances to be awarded an amazing prize just as Hardy was? Hurry up and give us a call at 800-827-2249 or email us so we can issue you a hole in one policy (they’re as little as $150). Who knows… you could be featured on our blog next! Interview with an Ace-Making Mercedes OwnerHole In One Prize Winner Scores New Set of Irons! 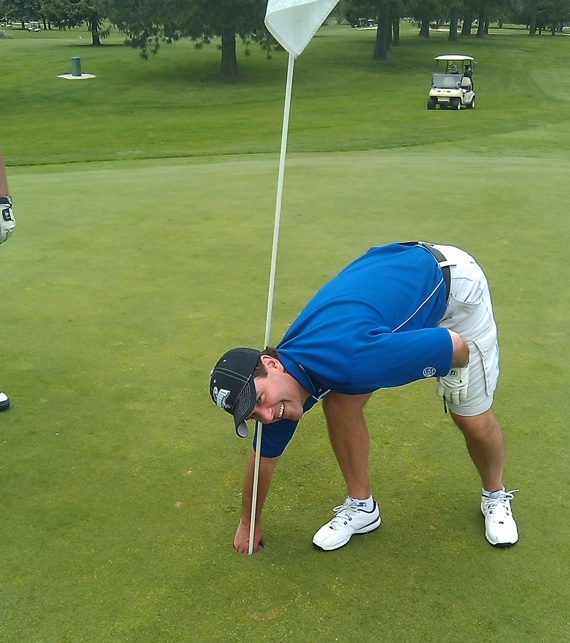 Home » Blog » Hole In One Lands Man $500 Gift Card!